Planning a vacation for the whole family? Scottsdale has you covered with age-appropriate activities and attractions that everyone will enjoy! Exciting desert adventures, hands-on museum exhibits, kid-friendly restaurants, and accommodating resorts and hotels are on tap and ready to be added to your itinerary. Scottsdale’s Sonoran Desert is an amazing landscape filled with unusual plants and animals. Adventure options include off-road tours by Jeep or Hummer, horseback rides, hiking, hot air balloon flights, and kayaking or paddle boarding on desert lakes and rivers. 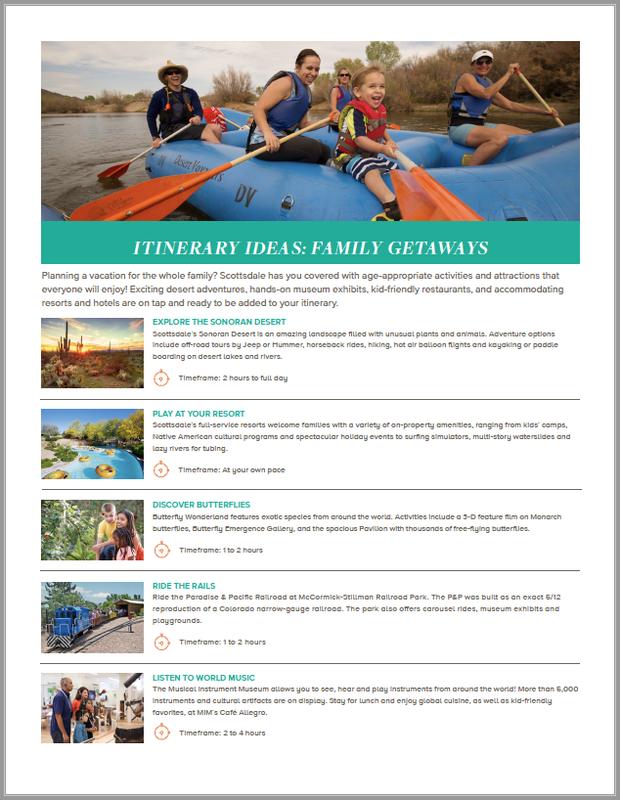 Scottsdale’s full-service resorts welcome families with a variety of on-property amenities, ranging from kids’ camps, Native American cultural programs and spectacular holiday events to surfing simulators, multi-story waterslides and lazy rivers for tubing. Butterfly Wonderland features exotic species from around the world. Activities include a 3-D feature film on Monarch butterflies, Butterfly Emergence Gallery, and the spacious Pavilion with thousands of free-flying butterflies. Ride the Paradise & Pacific Railroad at McCormick-Stillman Railroad Park. The P&P was built as an exact 5/12 reproduction of a Colorado narrow-gauge railroad. The park also offers carousel rides, museum exhibits and playgrounds. The Musical Instrument Museum allows you to see, hear and play instruments from around the world! More than 5,000 instruments and cultural artifacts are on display. Stay for lunch and enjoy global cuisine, as well as kid-friendly favorites, at MIM’s Cafe Allegro. The Phoenix Zoo is home to more than 3,000 animals, including 30 endangered or threatened species. Daily activities include Safari Cruiser tours, Monkey Village, Giraffe Encounter, Stingray Bay and a petting zoo. Enjoy lunch or snacks at the zoo’s Savannah Grill or Cavern Cafe. OdySea Aquarium, the Southwest’s largest aquarium, takes you on a one-of-a-kind voyage through the rivers and oceans of the world. You’ll see thousands of sea creatures, including sharks, penguins, sea turtles and exotic fish. Learn how plants and animals thrive in arid environments at the Desert Botanical Garden! The Garden offers five thematic trails as well as seasonal activities like the Monarch Butterfly Exhibit (fall and spring) and after-dark Flashlight Tours (summer). Octane Raceway’s electric European racing karts have a top speed of 45 MPH perfect for high-speed laps on the 1/3-mile indoor/outdoor track. Beginner and experienced racers battle for position through the track’s switchbacks and use straightaways to gain speed. There’s no age limit for racing, though unlicensed junior drivers must be accompanied by an adult. iFly Phoenix is an indoor sky diving simulator that lets you experience the freedom of flying! This adventurous experience includes all necessary equipment, a personalized training session and flight time in the wind tunnel.